Common genetic variants may underlie autism spectrum disorder and schizophrenia across human populations, according to a study appearing September 11th in the journal Cell Reports. In line with previous studies in Caucasians, the researchers found that Japanese individuals with autism spectrum disorder and schizophrenia have overlapping copy number variations (CNVs)–inter-individual variations in the number of copies of a particular gene. "The strength of our study is the systematic head-to-head comparison of pathogenic CNVs and biological pathways between autism spectrum disorder and schizophrenia," says senior study author Norio Ozaki of Nagoya University Graduate School of Medicine. "Previous studies in Caucasian populations found overlap in pathogenic CNVs between the two disorders, but their analyses were limited to a small number of genes and CNV loci." "Genetic overlap has been suggested in epidemiological and molecular genetic studies," says first author Itaru Kushima of Nagoya University Graduate School of Medicine. 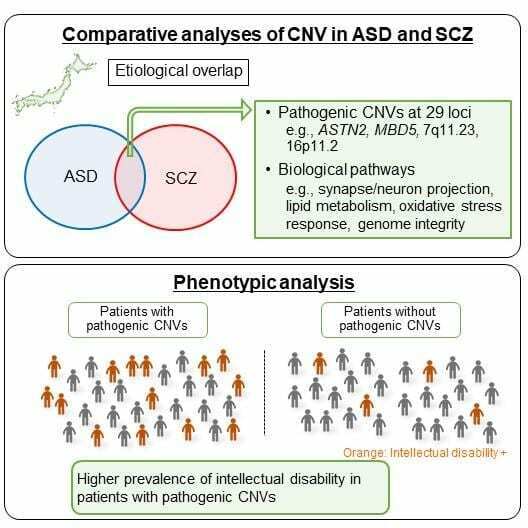 "In line with this, our systematic and comprehensive investigation confirmed a significant overlap of pathogenic CNVs between autism spectrum disorder and schizophrenia in a Japanese population." Additional analysis revealed that both disorders are associated overlapping biological pathways involved in the oxidative stress response, lipid metabolism, and genomic integrity. The researchers also identified 12 CNV loci potentially associated with these disorders in a Japanese population. Moreover, intellectual disability was strongly associated with pathogenic CNVs in both patient groups. "The identification of shared pathways and disease-relevant genes provides biological insights into autism spectrum disorder and schizophrenia," Ozaki says. This research was supported by the Ministry of Education, Culture, Sports, Science and Technology of Japan and the Ministry of Health, Labour and Welfare of Japan; AMED, the UTokyo Center for Integrative Science of Human Behavior (CiSHuB); the International Research Center for Neurointelligence (WPI-IRCN) at The University of Tokyo Institutes for Advanced Study (UTIAS); Research Group For Schizophrenia; Program for Advancing Strategic International Networks to Accelerate the Circulation of Talented Researchers of Japan Society for the Promotion of Science; SENSHIN Medical Research Foundation; and The Uehara Memorial Foundation.